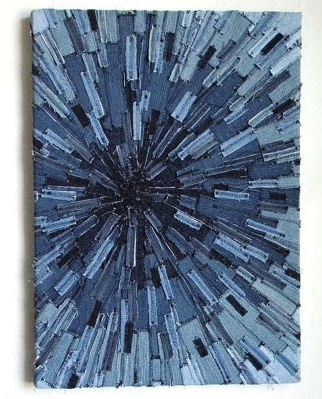 Denim is the source material for many artists and craftspeople creating wall hangings. Many use recycled denim because of the all the various hues created by the washing and wearing of denim. Gradations of color in denim is soft and appealing. The ultimate in ombre effect! 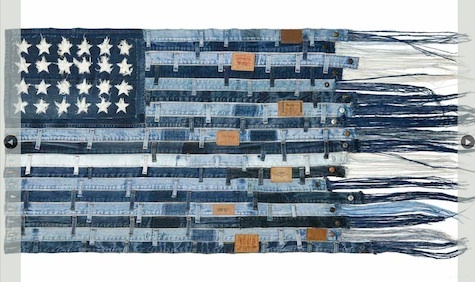 Of particular interest to me are some of the American flags and USA maps created entirely from denim. 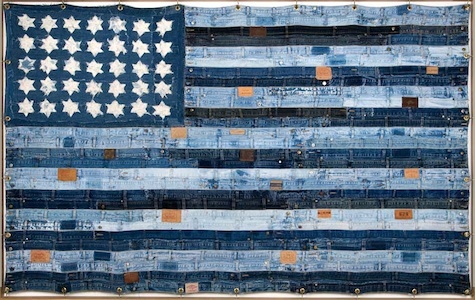 Denim, and blue jeans in particular, are certainly world-wide attire however they are particularly representative of American culture. I wonder if this is because of the history of blue jeans and Levi Strauss. These two flags are by British textile artist Ann Carrington. 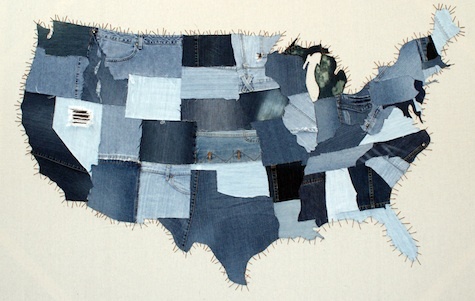 I found many USA maps quilted from denim as well. This particular one is available for purchase from vintage collectors at Splurge. Other wall hangings are more abstract. This one is highly effective because of the complementary bright orange stitching. Use of the Gradations is especially effective in this Starburst by Julie at Through the Cats Eyes. 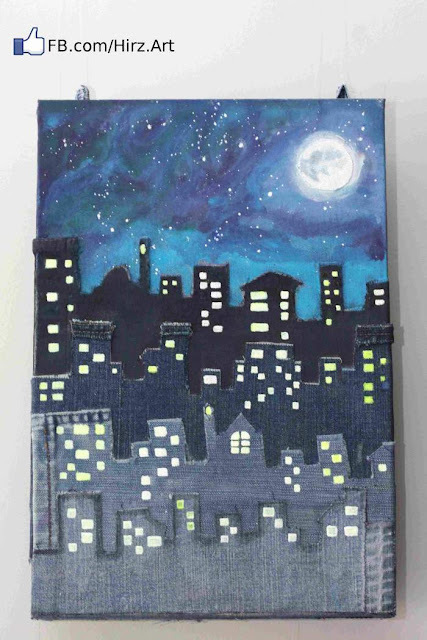 Mohammad Hirzallah used denim in this layered cityscape. A visit to Denimu's website is inspiring. 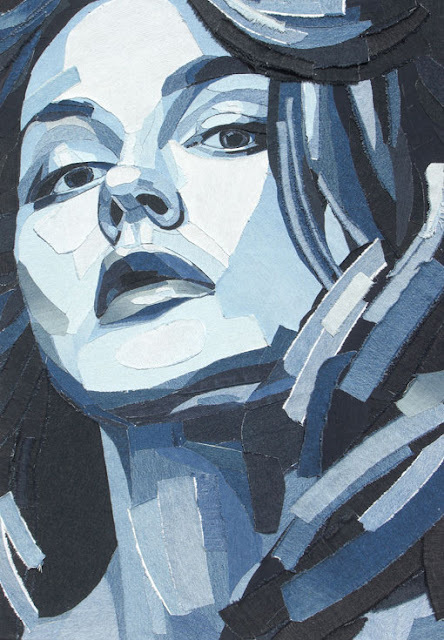 There are many portraits and urban cityscapes all created by using denim pieces. Very dynamic use of shape and contrast to create arresting images. Oh wow, what talent. Thanks so much for sharing these. 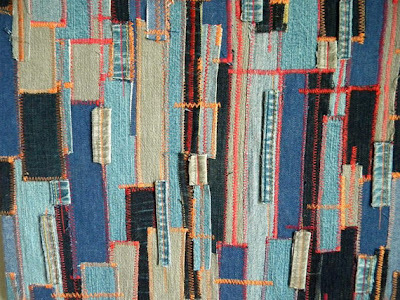 I fell in love with denim when I sat on a denim upholstered sectional displayed at a Pottery Barn in 2002. It was so comfortable and I hope to own one of these one day.